HCM CITY (VNS)— Dr. Tony Wagner from Harvard University held a seminar for business leaders, educators and parents, on critical skills for young people in 21st century. 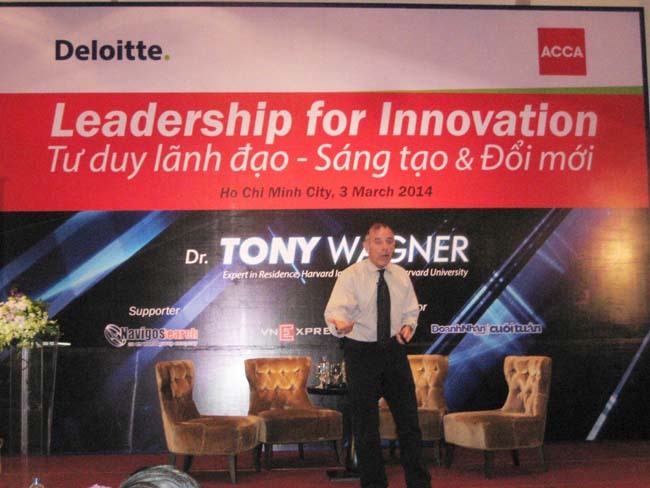 The "Leadership for Innovation" event was hosted by Deloitte and ACCA Vietnam on March 3 in HCM City. Jobs and professions in the 21st century require high-level skills that go beyond the classroom and professional knowledge, involving thinking and creative problem solving skills, Wagner told his audience. He discussed the "Seven Survival Skills" needed for young people today - critical thinking and problem solving, collaboration across networks and leading by influence, agility and adaptability, initiative and entrepreneurship, effective oral and written communication, accessing and analyzing information and curiosity and imagination. In conventional schools, students learn in order to achieve good grades, but in today's world, the best education, according to Wagner, emphasizes what he calls the three Ps- play, passion and purpose. "The play is discovery-based learning that leads young people to find and pursue a passion, which evolves over time into a deeper sense of purpose," he said. "Millennials are more passion-driven than achievement driven and their purpose comes from making a difference, rather than having a stable income as in previous generations." Tony Wagner currently serves as an expert in residence at Harvard University's new Innovation Lab and is a frequent speaker at national and international conferences in the US and is a widely published author.